Fairy style is for people who believe in fairies. You see, the little fairy on this style is real. She is a real, true, paper fairy. Her flower wand, her little wings, her cute dress, the flowers surrounding her, and even the fluffy clouds in the sky, all tell about the magic that's in the world. Fill your birthday celebration with magic, and bring the fairies to it, with Fairy style! 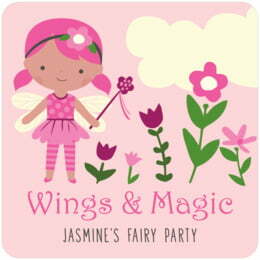 Customize your Fairy birthday coasters today to add a fun, personal touch to your celebration! Fairy Birthday coasters are available in multiple shapes—3.9" round, 3.9" square with rounded corners, and others. They are extra-thick, 58-point paper board. To give you an idea of how thick they are, a stack of a dozen coasters is about 3/4" tall. The coaster surface is coated with a smooth matte coating to provide beautiful, crisp printing. Birthday coasters are individually die-cut, so their top has a soft and rounded edge. They are designed to be disposable, but they are durable and re-usable. If unused, they can be kept as keepsakes and will last forever. Birthday coasters are printed on one side only. On the blank back, a small Evermine logo is carefully debossed. Birthday coasters come beautifully packaged in boxed sets of a dozen. 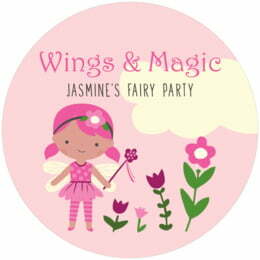 Click on the "Personalize" green button to begin creating your Fairy Birthday coasters today!